A sample concentrator is a fast and convenient way of concentrating multiple samples in a block heater at once. Utilising a simple gas delivery system the sample concentrator passes gas over the surface of your samples via stainless steel needles. This in combination with the heat from the block heater below produces ideal conditions for fast, efficient evaporation. The gas delivery needles are inserted into a silicon membrane, in virtually any configuration. 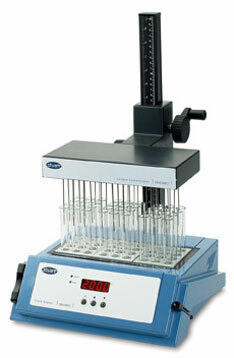 The height of the sample concentrators gas reservoir is located on an adjustable stand for accurate height control. This combines to make the sample concentrator compatible with any combination of block heater sample vessels. The gas delivery needles are available in either 76mm or 127mm lengths to suit various tube heights, optional PTFE coating is available for corrosive solutions. The Stuart sample concentrator is only compatible with the SBH130D/3 and SBH200D/3.